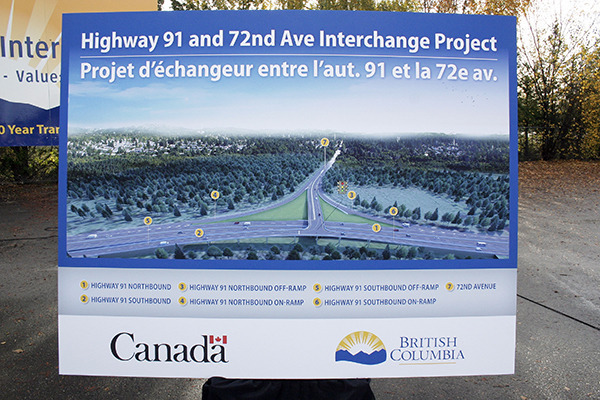 Local dignitaries gathered in North Delta last week to announce the start of construction for an interchange at Highway 91 and 72nd Avenue. 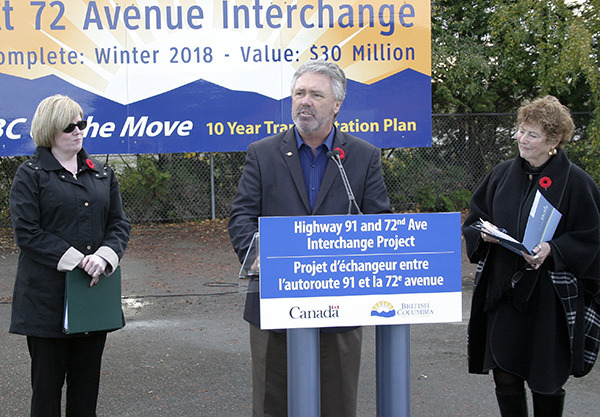 Delta MP Carla Qualtrough (left) and Delta Mayor Lois Jackson joined Delta North MLA Scott Hamilton to announce the start of construction for the new interchange to replace the traffic signal at the intersection of Highway 91 and 72nd Avenue. Delta North MLA Scott Hamilton was joined by Delta MP Carla Qualtrough and Delta Mayor Lois Jackson on Nov. 10 to unveil the design concept for the $30-million interchange. The federal government is contributing up to $10-million for the project through its Asia-Pacific Gateway and Corridor Transportation Infrastructure Fund, while the B.C. government will pay the remaining $20 million. The new interchange will be a half-diamond configuration, eliminating the only traffic light on the Highway 91 corridor and a major choke point for traffic. Hamilton said the Alex Fraser bridge currently sees about 8,000 vehicles per hour during the morning rush and about 9,000 per hour in the afternoon, adding that during peak periods, demand on the bridge exceeds its capacity, leading to significant delays. According to a government press release, the interchange has been designed to minimize impacts to traffic and ensure free-flow conditions during construction. That same release says the interchange will also help establish Highway 91 as the preferred cross border north-south route for commercial vehicles while increasing safety and relieving traffic congestion by creating free-flow traffic both northbound and southbound on the highway. “Transportation and distribution are a vital part of our local, regional and national economies. It’s critical that we provide for the smooth and safe movement of people and goods to foster economic growth and take advantage of the trade opportunities offered by Canada’s Asia-Pacific Gateway,” Qualtrough said. Hamilton said the interchange is part of the provincial government’s overarching plan to cut the congestion on the Alex Fraser Bridge. He said that in the short term, more tow trucks have been deployed to clear stalled and broken down vehicles, and the frequency and hours of coverage of highway patrols have increased in order to better monitor congestion, safety, accidents and debris on the highway. Hamilton also said that officials are looking into the possibility of adding a new counter-flow system for the morning and afternoon rushes. Further down the road, he said, the new 10-lane bridge to replace the George Massey Tunnel will significantly increase capacity and traffic flow. Hamilton said Ministry of Transportation and Infrastructure staff are working closely with the Burns Bog Scientific Advisory Panel to maintain the ecological integrity of Burns Bog and its surrounding area, adding many of the recommendations put forward by the panel have been integrated into the interchange design, such as maintaining water levels within the Bog to ensure the sustainability of plant growth and mitigation of fire risk. During construction the contractor, Flatiron Constructors Canada Ltd., is required to use stormwater protection devices, proper soil retention techniques and work only within the current highway right-of-way. Construction on the interchange will begin in mid-December and is expected to be finished one year later.